Mark Adamo’s Little Women is one of the few contemporary operas that have entered the repertory. Even The New York Times’ oft-quoted assessment, “some sort of masterpiece,” lifted it up, rather than jinxed it. 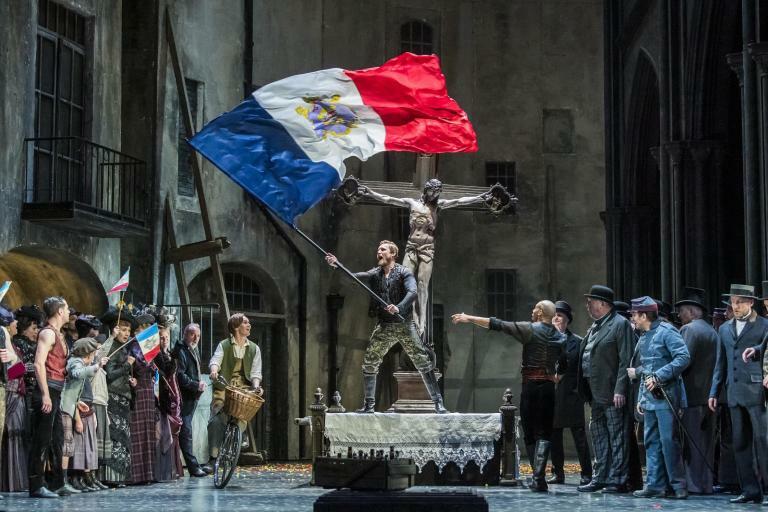 Its popularity is not confined to the U.S.: since its first performances in 1998, the opera has been seen in Australia, Belgium, Canada, Israel, Japan, Mexico, and the Philippines. Louisa May Alcott’s novel, in which she mined her own unorthodox, altruistic, and loving family for material, has resonated with readers since its publication in the late 1860s. The plot is universal ̶ some rush headlong into adulthood, others have to be pulled kicking and screaming, and there are those who sadly never have the opportunity. Most importantly, new love does not have to displace the old. Adamo captures those bittersweet moments in the carefully crafted libretto that he coaxed from Alcott’s lengthy tale, and in the musical language he employed. Percussion and woodwinds have stunningly beautiful passages throughout that punctuate the modern, but tame, musical texture. In this performance the vocal ensembles, where the characters display a wide panoply of emotions, were often more effective than the arias, in part because the young cast functioned beautifully as an ensemble. Adamo, however, composed difficult passages for the higher voices, marked by exposed high notes often approached by tricky leaps from below. Those challenging vocal lines did not always show the young singers, all students at the Mannes School of Music at The New School, to their best advantage. Tatiana Ogan was Jo, the sister who vehemently resists the passage of time. In the first act, Jo mainly reacts to the changes about her, Meg’s pending marriage being chief among them. Later, as the world of her childhood is no more, with her soulmate Laurie marrying Amy, Beth’s failing health, and her own budding success as an author pulling her away from home, she is herself changed. As Jo listened to Friedrich Bhaer (the fine baritone Chase Cornett) sing “Kennst du das Land,” the fretting, feverish look in her face abated, and for the first time she was feeling, rather than reeling from, emotion. It was if you were watching a butterfly emerge from its chrysalis. From that moment on, there was a richness and complexity to Ogan’s Jo that lifted the performance to a new level. As Laurie, Terrence Chin-Loy displayed a richly colored voice and eloquent diction. His high spirits and infectious smile, to say nothing of a remarkable ability to whinny like a horse, suited Laurie. The distinct personalities of Jo’s three sisters were limned vocally and dramatically by Ying Jin as Meg, Isabelle Freeman as Beth, and Maria Lacey as Amy. The most poignant scene was Beth’s farewell to Jo, where Isabelle Freeman captured the dying girl’s acceptance of her fate with a radiant simplicity. However, it was Jo’s moist eyes and the desperate expression on her face, coupled with the tableau of her family frozen in grief, that made it heart wrenching. Seldom is heartbreak so tangible in the theater. Taryn Holback was the girls’ aunt, Cecilia March, a wealthy widow who comes on like a termagant but has a soft spot for them, if not for their parents’ foibles. Garbed in the richest costumes, Holback was imperious both visually and vocally. What a treat! As the girl’s mother, Caitlin Cassidy, possessed of a fine, warm mezzo soprano voice, radiated pride over her daughters’ triumphs, bemusement over Jo’s tempests in a teapot, and true sadness at the death of the gentle Beth. Alcott’s focus was on the female protagonists, and Adamo’s even more so. The men dispatched their parts with all due professionalism, but the title is Little Women. Joseph Colaneri carefully sculpted the musical side of the equation, and The Mannes Orchestra played with clarity and subtlety. Roger Hanna’s set was a series of large walls with nooks and crannies that housed items ranging from the girls’ sleds to the esoteric symbols of their parents’ intellectual and philosophical pursuits. The costumes were of the period. If this ensemble had a star, it would be Laura Alley. Few stage directors can create scenes of such clarity and power with comparable economy of movement and gesture. Mannes lavished all the care and attention on this production that Adamo, who was in the audience, could wish for. Youth did the rest.